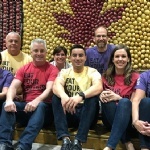 Canada’s EarthFresh Farms is spending $22 million to open a high-tech packing plant and distribution center near the Atlanta airport in College Park, getting its potatoes to southern customers more quickly. 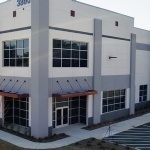 The Burlington, Ontario-based company is the latest food distribution center clustered in Atlanta’s budding Aerotropolis region. 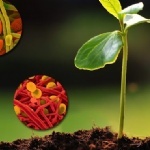 Biostimulants and biologicals – what are they? 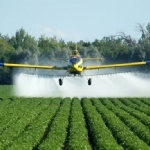 While fertilizers and pesticides play a significant role in attempting to overcome some of these obstacles, agricultural biologicals are said to make a crucial contribution toward the goal of making intensive agricultural production more successful and sustainable. Biological proponents claim that biologicals makes crops healthier, with improved defenses against diseases and pests, and better able to withstand a-biotic stresses. During the winter months the shed doors are firmly closed and all is quiet. 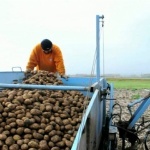 However, when you take a look inside you’ll find Dutch seed potato farmers are picking the fruit of their labour. After planting, crop husbandry, harvesting and storage the show begins. 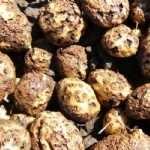 The tubers have to be graded in different sizes, soil, haulm and clods removed. They are inspected by hand and further processed for customers all around the globe. Prices of some vegetables, especially potatoes, in the Czech Republic have been increasing dramatically due to a significant drop in production, a new report from the US Department of Agriculture’s Foreign Agricultural Service has revealed. Named after the dark stripes that form inside potatoes after they are cut and fried, zebra chip disease is a potentially devastating affliction that can result in yield losses up to 100% for farmers. 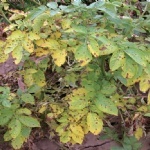 The disease, caused by the bacterium ‘Candidatus Liberibacter solanacearum,’ has been economically damaging commercial crops, including potato, tomato, and pepper, in the central and western United States, Mexico, Central America, and New Zealand since the early 2000s. We can watch the crop grow all day long and even though we can notice things from a macro-view, without a good regimen of sampling we will probably not know what is really going on in the crop. Soil and tissue sampling gives us the scorecard we need to really understand what is going on and to help us better manage the “players”. A new store has opened in the Canadian province of British Columbia, to keep food out of landfills and make sure more local families get fresh fruit and vegetables. ReFresh, a shop that offers produce deemed no longer sellable by grocery stores at lower prices, had its grand opening in the Cowichan Valley city over the weekend. Executive director Judy Stafford said the opening was a big success. 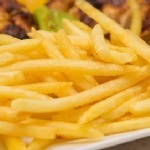 McCain Foods has selected ecommerce analytics provider e.fundamentals to help drive sales of its products through retailers’ websites. Nick Sultanti, ecommerce lead at the frozen potato products manufacturer, commented: “Ecommerce is growing in importance for McCain. We see e.fundamentals as the correct choice of data partner for us due to the simplicity of their platform and the ease of getting to the insights. 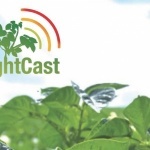 Syngenta BlightCast has been launched two weeks ahead of normal this season, with reports of early crops in the south west coming under pressure as plastic covers are removed. Whilst planting has been progressing across the country in generally good conditions, cool soil temperatures have slowed development. Now, with forecast temperatures set to warm up, growers and agronomists can be forewarned of conditions conducive to blight. 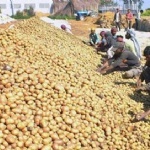 The US food and beverages giant PepsiCo has sued three farmers from Gujarat, complaining that they have been illegally growing and selling a variety of potato exclusively registered to Pepsico for the use of producing its Lays potato chips. PepsiCo India Holdings Pvt Ltd has informed the court that it uses the registered variety of potatoes called FL 2027, which is a hybrid of FL 1867 and Wischip varieties, for manufacturing chips for its brand. The company is the registered breeder of FL 2027. Phytophthora clone EU-13 was already known for being aggressive and difficult to combat. In recent years, two new clones have been on the rise in northwestern Europe: Eu-36 and EU-37. These clones are supplanting EU-13. The characteristics that caused these two clones to expand has now been researched by Wageningen University & Research. This information allows the combat strategy of phytophthora to be improved. 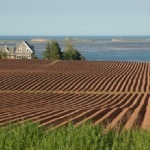 Earlier this week The Guardian newspaper on Prince Edward Island in Canada published the following Editorial on the relationship between Islanders and oil company J.D Irving Limited, owner of Cavendish Farms, producer of processing potatoes on the Island. 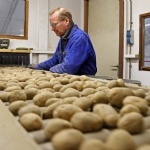 As the director of Oregon State University’s Hermiston Agricultural Research and Extension Center, Phil Hamm has been at the forefront of potato research for decades. All good things must end, however, and the time has come for Hamm to call it a career. He’ll retire in a few months. Hamm has spent his entire 45-year career studying plant disease, including the past 30 years at Oregon State in some capacity. 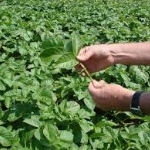 Currently under review in Canada, mancozeb is a potato industry staple for fighting late blight and early blight. 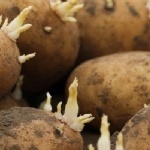 Its proponents fear its loss would spell higher production costs for farmers and would remove a vital tool for managing disease resistance in potatoes. 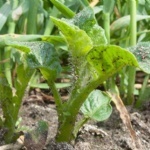 Canadian potato farmers could be facing higher production costs with the potential loss of a key weapon against late blight. Turnover and profits have dropped at one of the UK’s largest potato businesses, according to newly filed accounts. 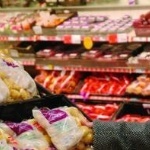 Lincolnshire-headquartered Branston, which supplies own-label products to supermarkets, such as Tesco, as well as selling under its own brand, has reported a turnover of £133.5m for the year to 29 July 2018, down from £143m in the prior 12 months. 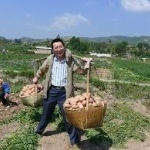 The potential of potato to provide food security is one reason China has undergone remarkable growth in potato production over the last two decades, and China has become by far the largest producer of potatoes in the world, write authors Wang Su and Jian Wang in a paper published in a special issue of the American Journal of Potato Research on April 9. 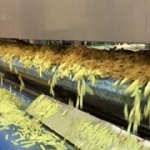 Dutch based manufacturer of weighing and packaging machines, Manter International, says potato processors are becoming more demanding, as they are looking for complete solutions when it comes to weighing and packaging, and not just simple machines. 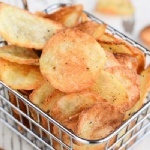 With the EU’s new regulation on the reduction of acrylamide now in force, manufacturers are under increased pressure to reduce the effects of acrylamide – the result of the Maillard reaction that naturally occurs between amino acid and reducing sugars when starchy foods like potatoes are fried at high temperatures. 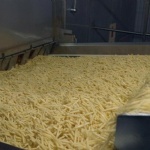 According to a report by the Lusaka Times, a German company that will locally produce French fries for both the Zambian and regional export markets is expected to commence operations this year. The announcement was made by Mr. Frank Nordman, German Agri business President earlier last week while on a visit to Zambia’s Ambassador in Germany, Anthony Mukwita, at the embassy offices on Axel Springer Street in Berlin. 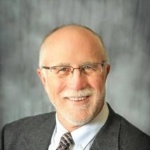 The World Potato Congress (WPC) is pleased to be offering its third webinar in its 2019 series with Dr. Gary Secor. Dr. Secor is a world renowned potato specialist and Professor in the Department of Plant Pathology at North Dakota State University in Fargo, North Dakota, USA. 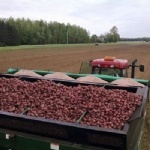 Dr. Secor’s webinar presentation “Best Management Practices for Seed Potato Handling from Storage to Planting” will be live on April 25, 2019 at 08:00 a.m. Central Standard Time. The Alliance for Food and Farming (AFF), a non-profit organization comprised of both organic and conventional farmers in the US, says health experts and scientists overwhelmingly agree that fresh produce, grown either conventionally or organically, is safe to eat for you and your children. 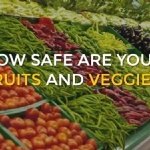 The AFF has developed an online pesticide residue calculator to measure the safety of several of the most popular fruits and vegetables when it concerns pesticide levels. Some eastern Idaho farmers foresee a slight delay in planting as they wait for snow to melt and their fields to dry. As Idaho farmers begin to decide when to plant, they can expect a warm wet spring. In the Pacific Northwest, the April, May and June precipitation outlook indicates enhanced odds of above-normal seasonal total precipitation, according to the Climate Prediction Center. 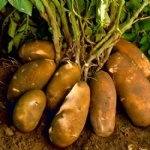 A one-of-a-kind combination of four active ingredients is said to help build stronger, more robust roots in potatoes. New to the Syngenta Seedcare™ portfolio, CruiserMaxx® Vibrance® Potato insecticide/fungicide seed treatment is now available. Your statutory planting return must be made via the online portal this year. Support will be available to all growers who need it, either over the phone or face to face in your own farm office. Jack Atkins, Levy Assistant, said: “The change will bring several cost savings and benefits. The online system is quick, efficient and is the most secure way to handle personal and financial data. 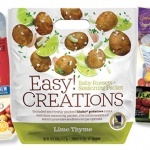 Side Delights potato dishes are driving traffic to retail stores, according to Fresh Solutions Network LLC, supplier to the brand. 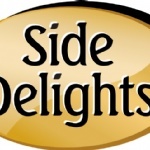 Side Delights cites Nielsen research about consumers who increasingly seek value-added convenience items, and a 2018 Date Check Pro study on millennials’ preference for in-store shopping over online when it comes to fresh produce, according to a news release. 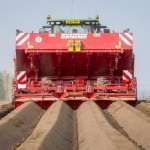 Dewulf, full-liner in agricultural machines for potatoes and carrots, stands stronger than ever in the market after a capital injection by family shareholders Hendrik Decramer and Thomas Decan, in collaboration with investor Jan Clarebout. In a press release issued earlier today, the company mentions that these three parties now collectively own all the shares of Dewulf Group. EarthFresh Farms is excited to announce their expansion into the Southeastern USA with an advanced technological packing plant and distribution center in Atlanta, GA. The new 140,000 sq. ft. packing plant and distribution center will operate as EarthFresh Atlanta, using the newest available technologies and equipment to serve customers throughout the Southern USA. If you are considering investing in a post-harvest processing line, the information included in this guide should make the process easier. It is not overly exhaustive, but will help you understand the process so you can find the perfect solution for your business. 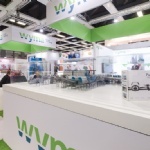 Wyma also publish a Guide entitled “Avoid potato bruising and increase profit“. It is said to be a handy guide to help you avoid potato bruising, minimise damage and get the most value from your harvest. Nearly 40 years ago, Maine farmers brought their rotten potatoes to Canada’s New Brunswick border crossings and put them to use. 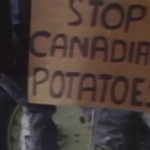 Angry about cheaper potatoes imported from New Brunswick and Prince Edward Island, they staged protests and blockades, which is where the potatoes came in. The strains of blight that potato growers face in protecting their crops are becoming ever more aggressive, as only the fittest survive. A good example is the recent strain 36A2. It is very capable of taking a crop down quickly, and even managed it in the heat of the 2018 summer. All it needs is some leaf wetness. Blight can change very rapidly, meaning these robust new strains are appearing in the wider population on a frequent basis. Compost application to agricultural fields can increase soil organic matter content and soil productivity. This study compared diverse compost products with a non-amended control in small plot and on-farm trials for effects on tuber yield and plant nutrient availability under rain-fed potato production in New Brunswick, Canada. The phrase “small is beautiful” is often used to champion small, appropriate technologies that are believed to empower people more, in contrast with phrases such as “bigger is better”. In the world of potatoes, the WP Griffin company on Prince Edward Island in Canada is inadvertently giving new meaning to this phrase. 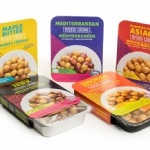 The company recently launched its new product line dubbed ‘Potato Cuisine Microwaveable Mini Potatoes‘ – a product that comes accompanied by selected spices from around the world. 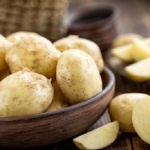 In a research paper published in the American Journal of Potato Research, scientists Lavanya Reddivari, Tianmin Wang, Binning Wu and Shiyu Li say that some foods promote inflammation and some reduce it. Chronic intestinal inflammation, they say, drives a variety of diseases such as inflammatory bowel disease (IBD), colon cancer, obesity, cardiovascular diseases, and type 2 diabetes, which plagues society today. The most challenging trait of CPB is its uncanny ability to develop rapid resistance to conventional insecticides. 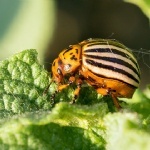 CPB can develop rapid resistance due to a variety of mechanisms, including enhanced metabolism, target site insensitivity, reduced insecticide penetration and increased excretion, write Mark Milenski and Manuel Campos, Entomologist at BioSafe Systems. The Kettle Brand started last year to tag its bags of chips with codes that make it possible for customers to see which farmers where grew the potatoes for them. Interested in learning more about how much work went into a single bag of chips and where the potatoes originated? 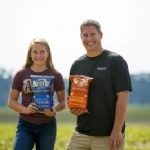 Kettle Brand potato chip company has started placing so-called Tater Tracker codes on its chip bags for customers to scan and learn about the farmers who grew them. 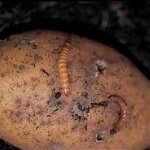 Potato growers across Canada will soon have a new option for controlling wireworms. BASF has submitted a registration for Cimegra insecticide to Canada’s Pest Management Regulatory Agency. 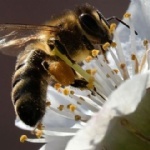 It is described a “broad-spectrum insecticide” for controlling chewing insects, according to the company’s crop manager for horticulture Scott Hodgins. The key insect target will be wireworm, he says. 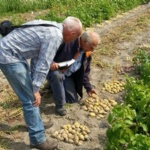 University of Wageningen researcher Corné Kempenaar and his colleagues at the Department of Agro Systems Research conducted a study to assess the cost benefit of adopting five variable rate application (VRA) technologies in potato production, writes Melanie Epp, contributing writer for Spudman magazine in the US. The United Potato Growers of Canada (UPGC) board of directors met last week in Halifax and reviewed the potato crop and market status across Canada. 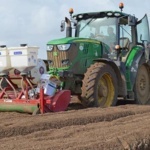 Overall Potato Stocks for March 1st are down 11.5% or 6.3 million hundredweight compared to March 1 of 2018. Fresh stocks are down 16.6% compared to a year ago and potatoes intended for processing are down 4,287,000 cwt. Seed stocks are 5.6% below one year ago. 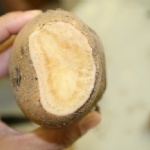 Despite best efforts at integrated disease management in the production field, the condition of tubers making their way to storage may require additional inputs to maintain quality in short and long term. 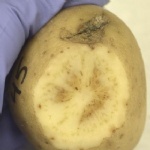 In this article, Amanda J. Gevens, Extension Vegetable Pathologist and Associate Professor at UW-Madison addresses treatments of a few of the most common potato diseases that growers can apply at harvest or post-harvest during the storage of the harvested crop. MENAFN (Daily News Egypt) reported recently that the International Food and Consumable Goods Company (IFCG) is planning to establish a new factory for the production of frozen vegetables after the increased demand, with investments worth EGP 350m. Mohamed Habib, the company’s export manager, said that the trend towards frozen vegetables production came after rise in the global demand for processed potatoes in view of the decline in Europe’s production of potatoes by 25%.